Meek Mill reportedly posted a long message on Instagram, claiming he is done beefing Drake, only to delete it soon after. 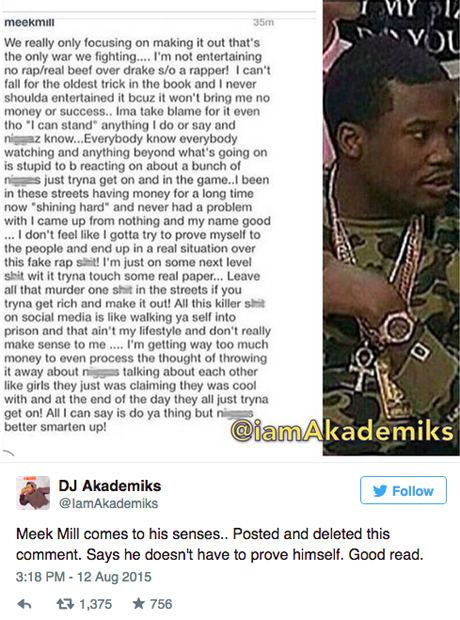 A screenshot of the supposed message, which sees Meek try to put an end once and for all to the back and forth shots being fired, has surfaced online. "I'm not entertaining no rap/ real beef over drake s/o a rapper!" he apparently wrote. "I can't fall for the oldest trick in the book and I never shoulda entertained it bcuz it won't bring me no money or success." In the rest of the message, which was posted on Twitter by a fan that took a screenshot of it, is hard to decipher, but the general message is that Meek has realised he shouldn't have called out Drake and no doubt, won't be doing it again. The message comes days after Drake's 'Back To Back' freestyle - aimed at Meek - charted in the US at a higher position than any Meek Mill single ever has. This week Meek also deleted his diss track 'Wanna Know' off his Soundcloud account, reportedly in an effort to avoid a lawsuit from WWE, as the into samples wrestler The Undertaker's theme song.